At least 14 people have been killed by two bombs at a dog fight in the volatile Afghan province of Kandahar. The blasts on Sunday occurred in Arghandab district, on the outskirts of Kandahar city, a police spokesman said. Five policemen were injured. Nato forces have been battling to take control of Kandahar from the Taliban, whose heartland it is. All the dead were civilians, Arghandab district chief Shah Mohammad told the AFP news agency. Twelve civilians were also injured, AFP reported, quoting Afghan interior ministry spokesman Zemarai Bashary in Kabul. No group has yet said it carried out the attack, but the Taliban regularly target large public gatherings. 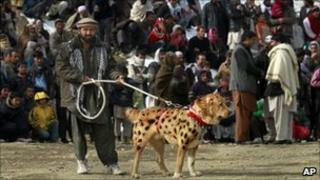 Dog-fighting competitions, which were banned under the Taliban regime, are a popular pastime in Afghanistan. In February 2008, at least 65 people were killed by a suicide bomb at a dog fight in Kandahar. On Saturday, a suicide bomber blew himself up at a buzkashi match in northern Afghanistan, killing at least three people. Buzkashi is a precursor of the modern game of polo, played with the body of a headless goat which is filled with sand.